Many of us idolized Jennifer Lawrence and why not, Jennifer is pretty without much effort, she can act and she is one of the few actresses in the Hollywood that doesn't much pay attention with her appearance. She basically doesn’t care if she’s gaining weight or losing it and she doesn’t like any of her fans to starve just to be perfect for other’s perspective eyes. 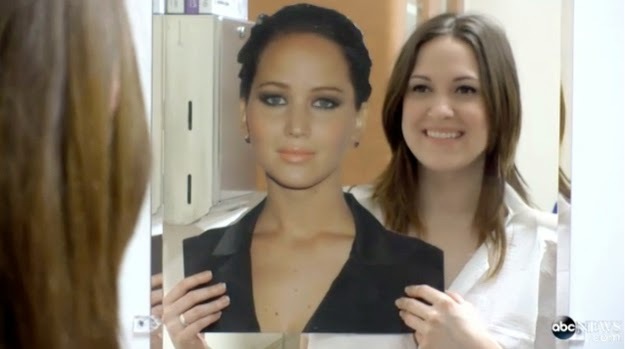 But unlike many of us, a fan named Kitty will go under the knife just to get the looks of her idol Jennifer Lawrence. The 30 years old wife has already gone from a month long of plastic surgery last February to become more like Jennifer Lawrence. His husband wasn’t actually convinced that she undergo to the procedures. Kitty with the picture of her idol. Kitty underwent liposuction into her face and body, a breast augmentation, rhinoplasty, and fat grafts to her cheeks and behind, which took six hours and cost $25,000, she gets a discounts for appearing on TV and interviews. Kitty has a 5 year old daughter and she admits that the money could be use in the future for the college fund of her daughter, but she also justified her reason that the money was saved from her previous job intended for a “me fund”. What do you think? Did she get what she wanted or just a total waste of money?